Nitrification is one of the most important processes in the global nitrogen cycle, converting ammonium to nitrate. Nitrification is a two-step process, ammonia can be first oxidized to nitrite by ammonia-oxidizing bacteria (AOB) belonging to the Beta-Proteobacteria and ammonia-oxidizing archaea (AOA) belonging to the Thaumarchaeota. The produced nitrite is further oxidized to nitrate by different groups of nitrite-oxidizing bacteria. Recently bacteria were discovered that are able to oxidize ammonium in one step to nitrate (Commamox) (Daims et al., 2015; Van Kessel et al., 2015). We are interested in the eco-physiology of all three groups of ammonia oxidizers in the environments. Microbial communities consist of interacting microbial populations. These interactions include positive interactions such as cross-feeding and negative interactions such as competition. In laboratory settings, most studies focus on microorganisms in pure cultures. We are interested in interactions of microorganisms, the mode of interactions and how these interactions benefit or harm the microbes in the environment. 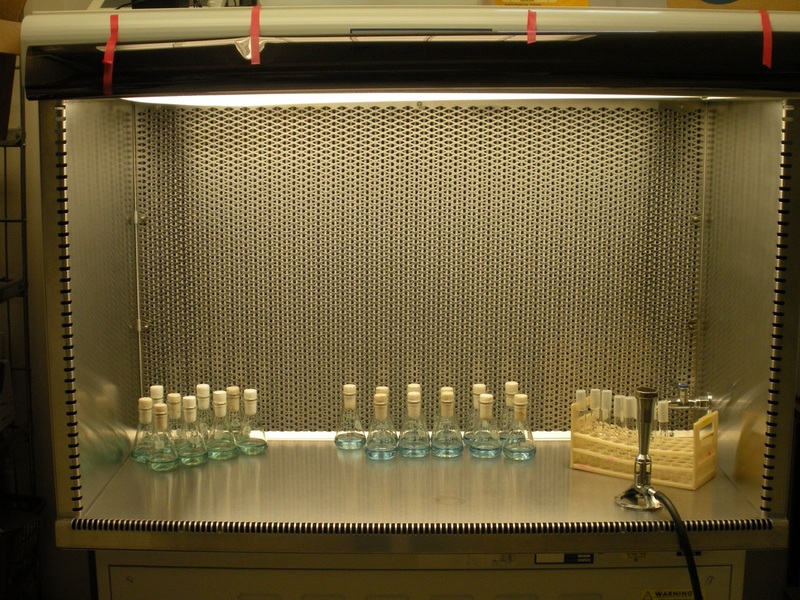 Around 90-99% of all microorganisms in the environment can’t be cultivated in the laboratory. Novel cultivation techniques and in-depth analysis of metagenomes have allowed in the past years to increase the diversity of cultivated microorganisms. We are interested in further developing techniques and to use information from genomes/metagenomes to cultivate bacteria from different environments. Ammonia oxidation can be carried out by AOA and AOB. While belonging to two domains of life, the two groups of microbes have a similar metabolism. They use ammonium as substrate for energy generation and fix carbon. Therefore, AOA and AOB while thriving in the same environment have to compete for their energy substrate ammonium. We investigate the contribution of both groups to ammonia oxidation in freshwater systems using a combination of cultivation dependent and independent methods. Competition of AOA and AOB for ammonium (French et al., in prep). Competition of AOA and AOB was investigated in chemostats at limiting ammonium concentrations. AOA and AOB abundance was followed by qPCR. The competition experiment showed that AOA are able to outcompete AOB under ammonium-limiting conditions. Future plans: We will investigate the contributions of AOA and AOB in the water column by in-situ experiments as well as cultivation based experiments in the laboratory that mimic the conditions in the lakes as well as possible, such as continuous cultures. Abundance and diversity of microorganisms involved in the conversion of ammonium in freshwater systems. ​We investigated the abundance and diversity of AOA and AOB in the sediment of Lake Erie and Superior (Bollmann et al., 2014). AOA were dominant in the oligotrophic Lake Superior sediments, while AOB were dominant in the more eutrophic Lake Erie sediments. The community composition of the AOA was clearly influenced by the trophic state of the lakes. The oligotrophic Lake Superior sediment was dominated by freshwater AOA from the genera Nitrosopumlilus and Nitrosotalea and the eutrophic Lake Erie sediment by members of the genus Nitrosophaera. 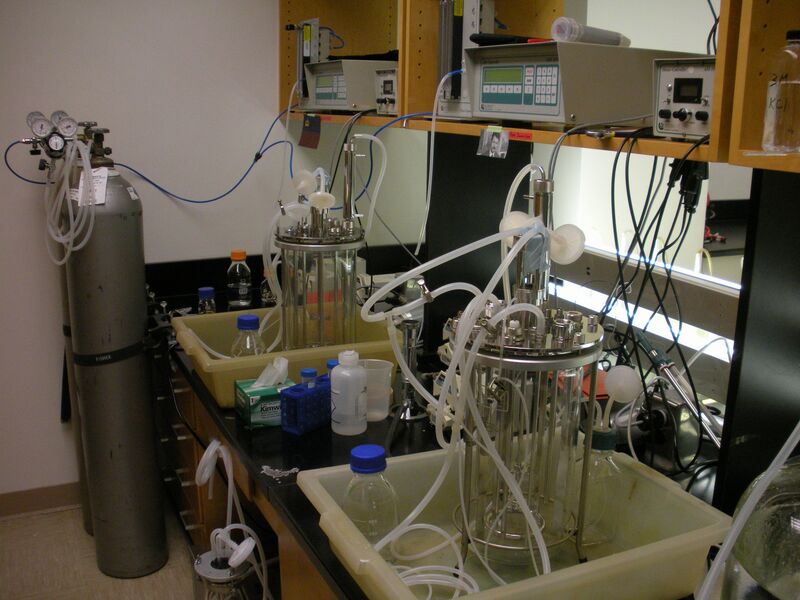 Future plans: We plan to expand the use of molecular markers to characterize the abundance and diversity of all processes involved in the production of ammonium by nitrogen fixation and ammonification as well as the consumption of ammonium by nitrification and ammonium assimilation in a variety of freshwater systems. 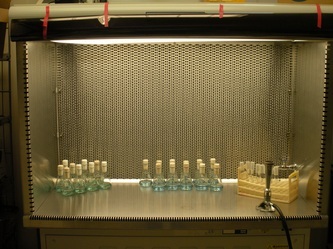 In enrichment cultures ammonia-oxidizing bacteria grow better than in pure cultures indicating that heterotrophic bacteria have a growth enhancing and stabilizing effect on the ammonia oxidizers. We investigate this effect using the enrichment culture G5-7 and the ammonia oxidizer isolate Nitrosomonas sp. Is79 as models (Sedlacek et al., 2016). 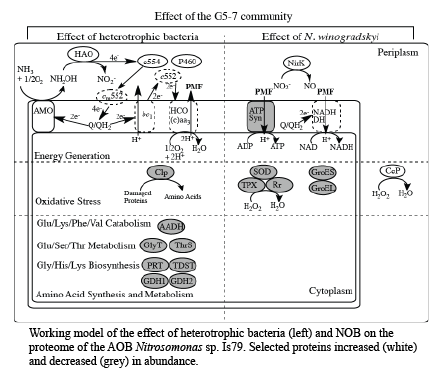 The presence of NOB and heterotrophic bacteria resulted in changes in oxidative stress response, energy generation and amino acid metabolism. Overall the changes point to a reduction of stress for the AOB and therefore a better growth environment. 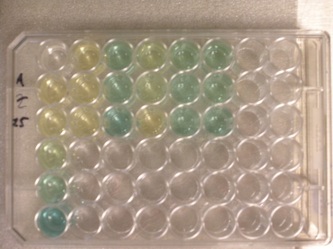 Future plans: We will extend this research to other enrichment cultures to determine the specificity of the interactions for ammonia oxidizers and heterotrophs. 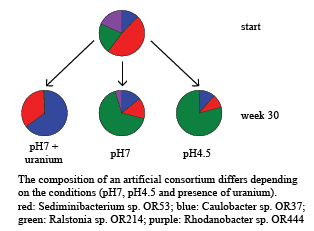 Bacteria from uranium contaminated subsurface sediment. Uranium is a highly toxic heavy metal. 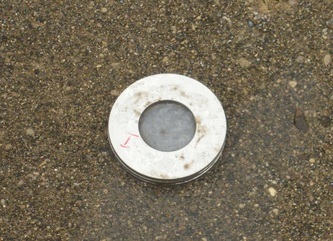 Bacteria have been isolated from the subsurface sediment in Oak Ridge (TN) using the diffusion chamber method (Bollmann et al., 2010). A large number of these bacteria have also been found using molecular methods, indicating the presence and survival of them in the contaminated environment. Laboratory experiments with different heavy metals as stress factors showed that the strains had different tolerances to uranium and other heavy metals. 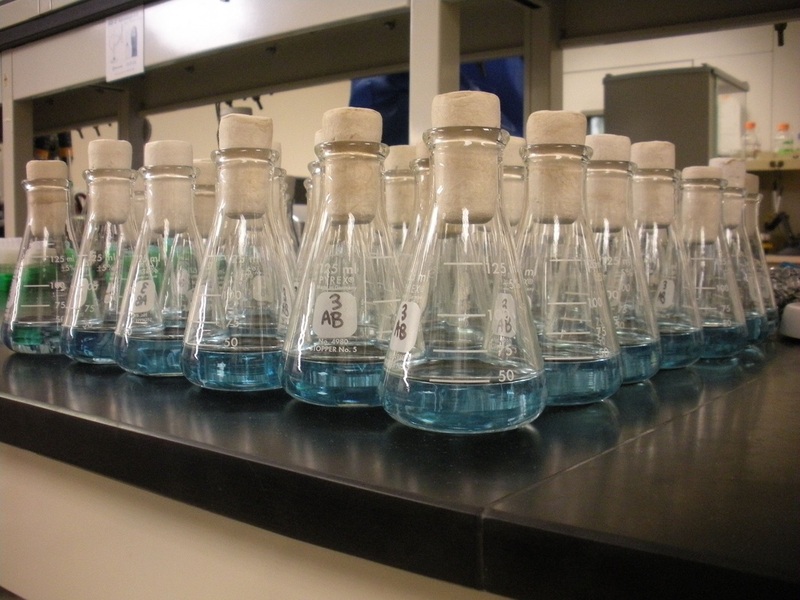 While found in the environment, some of the bacteria could not withstand in the laboratory the concentrations prevalent in the environment. Therefore, we investigated their ability to withstand uranium as part of an artificial consortium. The consortium consisted of four strains, two able to grow at the prevalent uranium concentrations and two not. After around 300 generations, the strains that could withstand uranium were dominant (Brzoska and Bollmann, 2016).